Great chart. I bet that BTC goes up in a rollercoaster fashion, as an ETF decision will most likely come in 2019. But it’s anyone’s guess really. However perhaps we are mistaken in looking at the charts in the same way as we do those of Currencies, since there are a few Large holders, many tiny holders and who sets the price ? The centralised “Bitcoin shop” seems the most likely Market Maker to me. Now we know that in “the old days” the “Market Maker” would raise the price of a share, to stimulate demand, then sell into that demand. Demand, though fairly thin does seem to increase a bit with the bounces off 6000 and the peaks of each bounce are progressively lower. I may be missing something, but I can’t think of “BTC” as a “Currency”, which would have a foot in reality, being linked to the GDP of and the production capacity of one or more countries populations and generally be unable to fall out of the tree. Nor can I think of it as a “share” with a fundamental value. Not even as a “Commodity” as generally speaking “Commodities” have a use - as a raw material or a valued consumable, or in the case of Gold - a store of value and hedge against inflation. Bitcoin to me possesses none of these attributes. To me it seems to have more in common with those “toxic investment bundles” palmed off on the investment community by the Banks as “investment packages” - Those bundles largely blamed for the collapse of confidence in the Banks, causing the recent “crisis” which could easily have spilled over into a collapse of confidence in money itself ! We could IMO just be witnessing the very beginnings of another such situation and the collapse of “Bitcoin” could just lead people to ask " well what is the difference between Bitcoin and ‘Real money’ ? " The answer to that question, when pondered is “Actually very little” ! It currently costs roughly $6000 in electricity to mine a single bitcoin, so BTC miners have a large interest in artificially keeping the price above that number. Public interest has evaporated, and the peaks are getting weaker, so they probably won’t be able to keep it above there for much longer. Even if BTC did start pumping significantly again, all the miners who have been hoarding their mined coins to help keep price above 6k will begin to offload their supply, killing the bull market in its infancy. However, that being the case, how did it manage to start off life at around $0.30 ? Keep in mind that the mining dificulty rises the more coins(blocks) are mined. So the electricity costs where lower as well. It’s also important to note that in the different countries the electricity is priced differently. So, yeah. For example: In the USA the price to mine a BTC would be 9k, in Germany i would be 2k (those are just hypotethical prices - for the sake of the example). And so on, there are a lot of factors. In the beginning - you could mine only with CPU, then GPU, then you needed multiple GPUs, then a GPU rig was needed. Now you need a special miner linked into a mining farm… So, yeah. The more blocks mined = the better hardware is needed. That’s to do with block halving and the mining difficulty increase over time. Having said that, the electricity cost of mining a single bitcoin was probably greater than whatever the price was back then, but the early miners were hoping bitcoin would take off at some point and make it profitable. If you mined in 2009 with an ordinary office computer, you could have easily mined thousands of bitcoin by yourself. With the same computer you wouldn’t be able to even mine a single bitcoin in the entire year of 2018. Satoshi (bitcoins creator) is rumoured to have mined over a million bitcoin at the very beginning while there was no competition or mining difficulty. Then why on earth would anyone risk “mining”, just to break even given the fact that what you say here seems logical. ? Especially when the whole thing is of no intrinsic value whatever ? The hopes are that once all the coins/blocks are mined their price will rise exponentially due to the scarcity. The amount of coins that can be mined are not infinite - so, the less there are = the harder they will be to come by => price will rise as the demand grows. That’s what we saw last december - too much hype and demand. The FOMO was real. The reason why I would be very cautious about investing in Bitcoin or any other cryptocurrency is that governments won’t allow decentralized currencies to threaten their own sovereign currencies. Cryptocurrencies are still marginal, so governments stay idle. But if any crypto seriously threatened, say, the USD, its days would be numbered. Every major government in the world is contemplating the introduction of its own cryptocurrency. So there’s a real chance that all cryptocurrencies, except those issued by a government, will be banned. That will allow governments to harness the blockchain technology while retaining control of money. Are Cryptocurrencies a Real Threat to Gold? Are you an automated spam bot? The case for sovereign cryptocurrencies is even more compelling. As soon as we have a “crypto dollar,” “crypto renminbi,” or another sovereign currency, governments will be able to get rid of money laundering, tax evasion, and avoid a lot of other problems that come with cash. A thought has just occurred to me … If I had bought 100 when I was thinking of doing so for say £100 - I could have sold them at Xmas or thereabouts and bought 20 houses to rent out with the proceeds. However, bitcoin according to previous posters costs more and more to produce as it’s numbers increase. So it is an “asset” with limited supply. So lets look at it as a useable currency - say I take on a mortgage for 50 bitcoin to buy a house with an equivalent value of say $300,000 . at say 6% interest - what is my monthly repayment in bitcoin ? Now assume I work and get paid 2 bitcoin a month for my efforts. If the Hype is correct, in a year’s time my wages will probably have gone down to 1 bitcoin a month or less. but my mortgage payments will still be the same ! in 2 year’s time, I will have been repossessed because of teh increasing value of bitcoin against any measure of wealth or earning capacity. ie MASSIVE DEFLATION is taking place if we even try to think of it as a currency or “money” Buy a house today, it will be worth 1/4 of what you paid for it in 3 years time. You can NEVER sell it for a profit ! - How can you run any system with these attributes for their monetary system ? Wow this chart is crazy. The good old days of 2017 when FOMO and price manipulation ruled. Your thoughts on the future, @Clint? I think there’s money waiting on the sidelines looking for way more stability than we’ve been seeing. Your thoughts on the future, @Clint? Forecasting the future price of bitcoin is way above my pay-grade. But, just for fun, I’ll mention the latest predictions of über-bull James Altucher. In a recent promo-piece for his cryptocurrency newsletter, Altucher detailed 4 crashes over the history of bitcoin, ranging from -70% to -92%, the 4th crash being the latest one (last winter). Each of the previous 3 crashes was followed by an exponential price rise, and Altucher claims this 4th one will be no different. 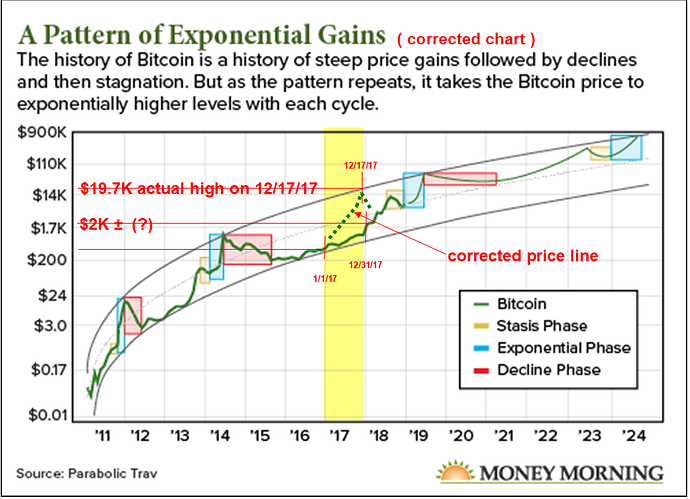 He not only predicts some mind-boggling gains in bitcoin, but also pins down the exact trigger and the exact trigger date that will launch these gains. Altucher’s mind-boggling bitcoin prediction is $100,000 by January 2019. 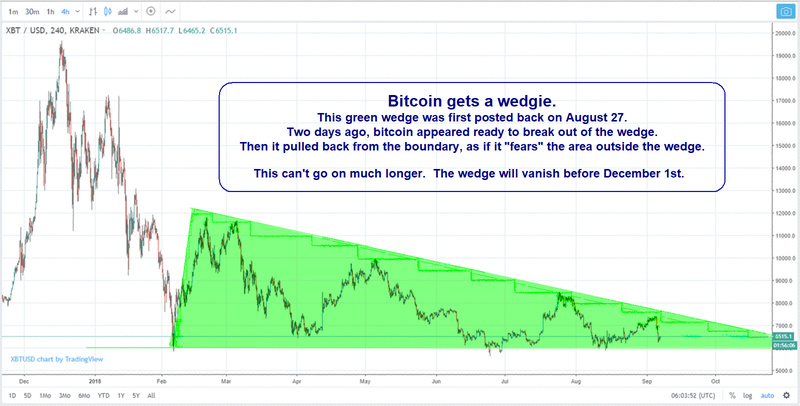 And the trigger he claims for this unbelievable bull run will be the approval of a bitcoin ETF by the U.S. Securities and Exchange Commission (SEC) on September 30, 2018 – five days from now. And $100,000 bitcoin is not Altucher’s most outrageous prediction. He says bitcoin will hit $100,000 on its way to $1 million – in a single move. You can’t say the guy doesn’t hang it all out there. That guy is something else for sure. You can’t say the guy doesn’t hang it all out there. Altucher’s mind-boggling bitcoin prediction is $100,000 by January 2019. Wow, what a prediction. I would think that a rally like pictured would move soooo much more in October and November, right after an ETF release. But $100,000K… in 3 months? I don’t know Maybe a move back to $20K by the new year, and then the insane money in 2019 Q1. Unless institutional money goes crazy, but I imagine “they” would look to more than just one ETF being approved to really get moving. Here’s another very bullish prediction for bitcoin. 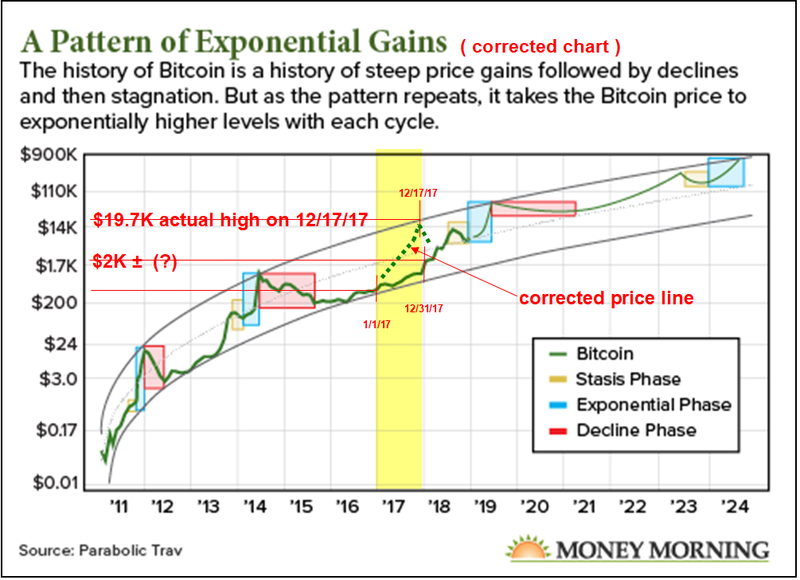 This one, published a couple of days ago in ProTrading Research, is not quite as extreme as James Altucher’s prediction; even so, it shows the bitcoin price approaching $100K around mid-2019. 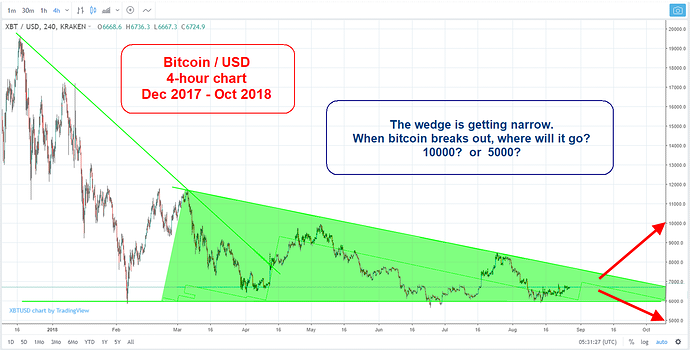 I have copied and pasted an enlarged image of the chart displayed in the article, and then posted a second image of the same chart with corrections to the price pattern shown in 2017. I did not check the price pattern in any other year. What the creator of this chart is trying to show is that the long-term swing highs and swing lows in the bitcoin price lie on similar parabolic curves which are rising with respect to the chart’s logarithmic y-axis (the price axis). 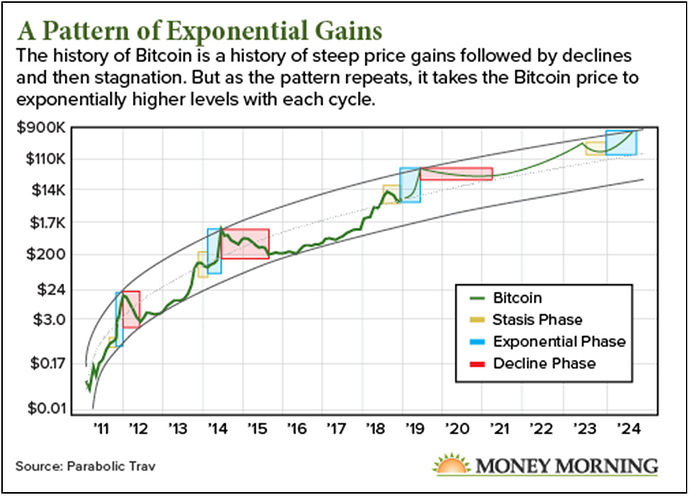 Accordingly, the long-term bitcoin price trend is also following a rising parabolic curve, essentially tracking along the mid-line between the swing highs and swing lows. All of that may or may not be accurate, depending on the price line plotted in the chart. The error I noticed and corrected in the 2017 prices does not invalidate the author’s theory regarding the price trend, but other (undiscovered) errors might make it invalid.